That is a very fitting excerpt from Scrubs! You could also use quotes from the Married with Children episode where Al Bundy goes to an all-you-can-eat fried clam buffet, fills up multi-gallon-sized black garbage bags with the clam fritters, and absconds with the "booty." Later, Al finds out on the evening news that the clams were poisoned with toxins from the ocean! Haha! I love Al Bundy! I think there is also a Simpsons episode with Homer, that has a similar premise. I just realized, you are a great resource for "affordable" eats in the Orange County area. That dim sum place you previously posted about and this sushi place are great finds. Thank you for letting us know about this great find! Sushi is one of my favorite foods. It's comfort food, and healthy to boot! Our family will be stopping there for sure upon on next visit! I want sushi so bad now! I'm going to have to stop over at Mitsuwa today. How is their Toro sashimi? Mirugai? Yellow tail? Salmon? This is a good place to meet up. Sweet! Time to finally use those coupons on my fridge. I didn't know if this place was worth paying a visit. Elmo, you're definitely right about 'cheap sushi'. Two words that are definitely scary when put in the same sentence. Usually, that sentence also includes the word "Todai". I've accepted the fact that good sushi costs money, but sometimes you may find a nice place. If you've read Bourdain's Kitchen Confidential book, he says that you shouldn't eat fish on a Sunday or Monday. Not sure how it applies to sushi places but I'd imagine that eating on wed-sat should be safe. This place looks great! I was thinking of Honda-ya for tomorrow night but, now I'm not so sure... Too bad I threw away the coupon already! I live in Northpark as well. 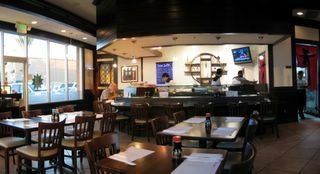 Haven't tried S. Sushinoya since the new owners... Have you? It used to be pretty good. Have you tried Tomikawa on Jeffrey? New owners there as well. Dined there last week and it was pretty good. Have your fancy and delicious sushi while I got stuck in a red velvet hand chair waiting an hour for an overcooked burger. Have you no decency, sir? At long last, have you no decency? I remember the Simpson's episode where he tries sushi for the first time. At first he was hesistant, and then after his first taste, he enjoys it so immensely that he orders everything on the menu, finally demanding the dreaded fugu. "Fugu me!" he bellowed. Then he finds out that he might have just ingested poison. Luckily, the map to the hospital is conveniently printed on the back of the menu. Loved that episode! And I love this new sushi place! Yen Sushi? I haven't heard of it! Is Maizuru still over there? I used to live near Alton and Jeffrey and I remember going to Maizuru, next to Gelson's. They were pretty decent at the time (this was about 4-5 years ago). Where exactly is Yen Sushi? Hope you got a chance to get your sushi fix. I think I need another shot of it soon! Unfortunately, I only tried their rolls. I didn't try the mirugai or the toro. 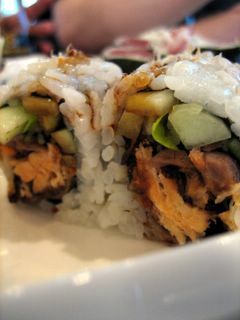 But the yellowtail roll was quite fresh - clean and tangy. The salmon was good too. By the way, I need to set your expectations here. This place should not be considered traditional. It's actually quite non-traditional. Sushi rolls abound and while their nigiri is good, it's not to the level of Sushi Shibucho's omakase. Sushi Shibucho exists on a separate plane of existence. Think of Sushi Shibucho as a Lexus. Think of Maki-Zushi as a Toyota. Both are good, but you do get what you pay. Actually the best part is that you don't even need a coupon for the 20% off deal. It's actually a better deal than the $5 off $30 coupon in those mailers. Agree with you wholeheartedly on the Todai comment you made. Consuming any type of raw sushi left out on a buffet line is just a real risk. Now those rotating sushi bars, I haven't quite made up my mind on them. I've eaten at one once, and the potential for someone sneezing on a plate as it goes by was terrifying to me. Don't pass up Honda-Ya! I love Maki-Zushi, especially during the special they're running, but Honda-Ya is a must try if you haven't before. Just stay away from Honda-Ya's sushi. 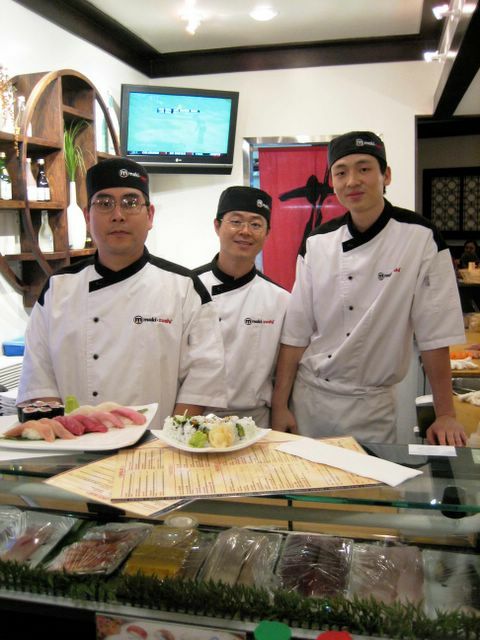 They do cooked foods well, but not sushi or sashimi or anything else that is served raw. I have tried Tomikawa recently! It's actually the usual place I go to for sushi in Irvine. I was actually going to do a post on it, because I did enjoy it. I enjoyed it much more than I did Mitsui, which I reviewed a few weeks ago. I haven't yet tried S. Sushinoya though. Perhaps soon, but maybe not until Maki-Zushi stops offering their 20% off dinner deal. It's too much of a boon for me to pass up. Maizuru is still there in the complex with the Gelson's. Yen just opened up on the other side in the complex with the Ralph's. The two complexes are divided by Jeffrey. 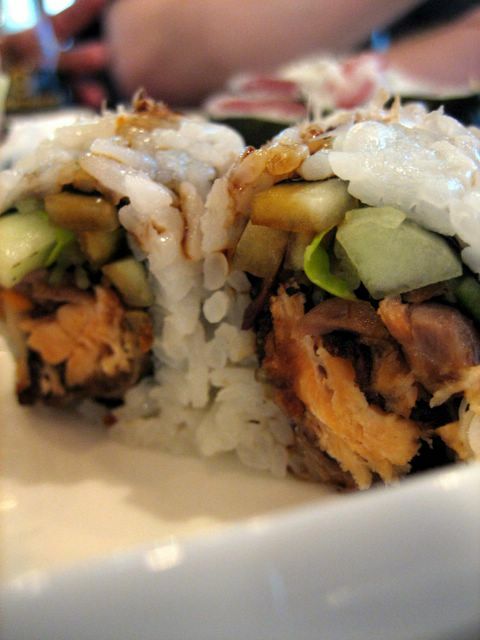 Like Maki, their fish is fresh, but their strength is in the rolls. I love this. I always keep a look-out for inexpensive sushi. Thank you once again for giving me a place to remember to swing by if I'm in the area. Also, just wanted to say that I went to Strickland's because of you and it was the best soft-serve anything I've had in my life. I will be going there every weekend now. I loooove salmon skin. If it were packaged as chips, I'd buy it and eat it while watching TV. ...actually anything involving surgeons with knives or lasers in general. I've got to set the expectations here. I think I'm setting up people for disappointment if I make this place out to be a revelatory or divine sushi experience. It's not. It is simply good neighborhood sushi, for a really reasonable price. Sushi Shibucho has nothing to worry about this as competition. But that said, please enjoy! And thanks again for writing in! got any extra 20% off coupons? i'm a cheap mo'fo' myself. just ask the wife. 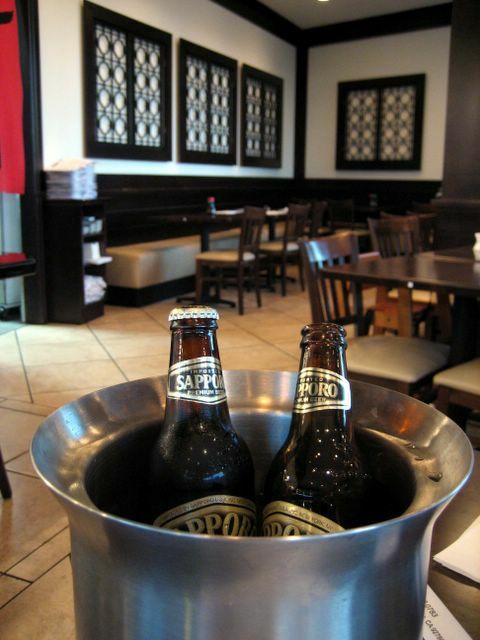 20% off is great, but that comp'd dinner you had is even better. When can this humble food blogger get in on that kind of action? Thanks for humoring my lame poetry attempt. It really doesn't deserve any praise. Re-reading it makes me cringe! HAHA! But knowing that you liked it so much to liken it to Dr. Seuss makes it all worthwhile. The sushi pictures are making me really hungry right now. If you ever go to the west side, you have to try Hide Sushi on Sawtelle. Their uni (sea urchin) sushi, ankimo (monkliver fish) sushi and spicy tuna rolls are the best! I really have to make a trip out to Sawtelle. I've heard so much about it! If you can believe it, I've been back an additional four or more times, making a grand total of close to ten or a dozen time within the past month. Let's hope the 20% off dinner holds for a while. Love the pics. Great to find other foodies behind the Orange Curtain. Tried this place last week because I saw it on your blog. This has to be one of the best deals around. Loved the scallops. The conch...well, it's definitely not abalone. Everything else was very good. I'm looking forward to going back again soon! My friends and I are addicted to this place. Last week alone we went three times! It was like every other night. We usually leave there spending only about $10.00 per person. I think the people who work there are starting to think we are some sort of sushi-freaks! Thank You! My wife and I went last Friday and I fell in love with this place. I loved the sushi so much that I went back the next night. I love their Altantic Trasure Roll!! I will definitely be back there this weekend. When you come back, chances are good that we'll be dining together. I was just there again on Thursday night. We're in there just about three times per week now. It's almost an addiction. By the way, here is a tip. The Maki-Zushi Roll (Baked Lobster on top of California Roll) and the BSCCR (Baked Scallop Crunch California Roll) if ordered TOGETHER will cost you only $10.99. This is a great deal! It doesn't qualify for the 20% off, but it's delicious and filling! i just went tonight and i have to agree that this place is great. I was shocked when i saw the bill at the end. I was stufffffeeed and had a couple sakes and it ended up being 43 after tax before tip for two. Wow. Tustin. I lived there for several years. Brings back memories. There was a little Korean BBQ place there that I really liked - The cook your own meat at your table. I wish I could remember the name. Makes me dread my boring turkey lunch. Ain't it great?! I've got to try omakase there one of these days. See what they can really do! I think I know just the Korean BBQ place you're talking about! 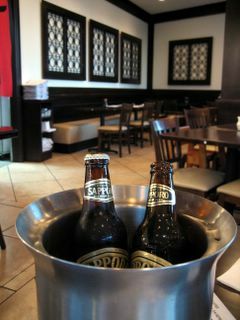 Seoul Garden on Redhill in the Drug Emporium plaza. I've been there a few times too. I liked that they had a coupon for UC Irvine students. Those undergraduates would come in and stuff themselves like rabid dogs for under $20. I am glad you reviewed this place! I have already been there 3 times since reading your blog 2 weeks ago. I love their prices and great beer deal! Not to mention that the rolls and sushi are delicious as well. 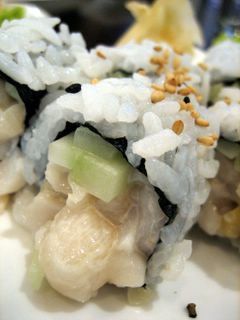 I'm a new fan of yours and I tried Maki-Zushi for lunch the other day after reading your blog. I must say the food did not disappoint. We had a sampling of 3 different rolls, each very good...I'd go as far as to say some of the best sushi I've had. And for two of us, 3 rolls were well portioned. I wanted to scream, "I'm full!" as in those Taco Hell commercials...but I refrained. Now I must disagree slightly on the "cheap" or even "affordable" characterization of this restaurant. The three rolls ended up costing the two of us about $40 after tax and tip. Now I wouldn't say this is pricey for sushi, but I did not find things as you did... Just saying...I'd still recommend this to anyone who enjoys fish in the raw. I've not been in a while. I think I finally reached Maki-Zushi overload. But I think I'm over it, and might come back this week. I'm glad you got a chance to try it. But you're absolutely right, lunch there is expensive! I walked out once spending $30 for a few rolls. Dinner is where the bargain lies. Up until a month ago, they take 20% off dinner automatically. My friends and I usually spend $11 per person on average. I'm not sure if the offer continues now, since business has started to pick up. BTW, I had omakase there about two months ago and spent $70 per person! Great stuff (with a few misses here and there), but it was the most expensive sushi meal I've had yet -- even after taking off 20%. Hi. I think you re-posted this Maki-Zushi entry via RSS Feed. It showed up on my LiveJournal Friends page. I went there thinking they still had the 20 percent off dinner, but it was no more. Just wanted you to know. I did re-post, but ironically it was to add an update (around Dec. 22, I believe) that they no longer offeredd their 20% off dinner. Hopefully you liked the food enough that you didn't mind spending the full price. For me, it tasted a whole lot better when it was cheaper! Oh, it was good! And close to home and relatively cheap compared to other places. I've easily paid $45 or more for myself at one sitting. At Maki-Sushi, I had the yellow tail, salmon skin, spicy tuna, salmon, soft-shell crab, and unagi. And I only paid about $30 (including a generous tip). Maki-Zushi became our family's favorite restaurant. Yoshi, the sushi chef is great! I usually ask for his recommendations and he has always impressed me with the freshest sushi. I love their Maki-Zushi rolls and California Hand Rolls (gotta try this, much better than the regular Ca rolls). Our family's another favorite dish is Maki-Zushi Platter that comes with sashimi, tempura, choice of teriyaki, choice of rolls and salad. Thie Happy Hours are 5-7PM and they give out 20% discount. The pictures make me want to go again!!! Hey Elmo, it's Anon Taco Nazo lover. I wanted to ask you if you had a suggestion for me for my 31st bday dinner. We just went to Aire in Costa Mesa for my room mate's bday. It was great btw, great restaurant great service. We had the entire outdoor patio to ourselves. Well anyway. I wanted to look for a similar type of place. Good food, Good drinks, Hip, unique, Pimp.. u know... Let me know.. Thanks! Thanks for the tip on the Happy Hour. That's reason enough to eat dinner early. Mastro's Steakhouse - Classy, sleek and the best steaks this side of the country. 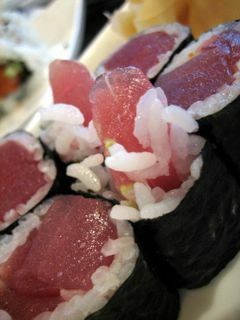 Bluefin - Best fusion of Japanese and French ingredients, top-notch, but expensive too. Park Avenue - Hip, retro, Rat Pack hangout, with a creative spin on American classics. Elmomonster, yet another fine recommendation! Just had dinner at Maki-Zushi this evening, and I was very impressed, with the service, price, and the overall quality of sushi. Who says you can't have value for money? My SO and I had the sushi boat for two (wow, such presentation), with yellowtail sashimi, crunch and spicy tuna rolls, miso, rice, tempura and teriyaki for less than $30. I couldn't even manage a dessert (the green tea creme brulee sounded delish though - will try next time). And it's local - who knew? Thanks again and bon appetite! I have eaten at Maki-Zushi a few times now. It's close to my office. I have to agree that the quality of the sushi and the flavors of specials they create daily are among the best! I love eating there and try to go at least once a week for a healthy meal that helps me stick to my budget! My son turned me on to this place and I’m glad he did. We arranged to meet at the restaurant one evening a few months ago. I arrived first and while waiting in my car for my son I observed two deliveries of fresh fish. Definitely a good sign for someone who craves FRESH raw fish. We decided to order Omakase and the sushi chef did not disappoint. 3/4 of the meal was composed of things I have never experienced before (clams, needle nose fish, toro from different parts of the globe and lobster sashimi from Santa Barbara) and they were all delicious. We shared the bar with people who really seemed to know their sushi and the chief was really great about informing us about what we were eating and how to eat it correctly. Overall an experience well worth it.